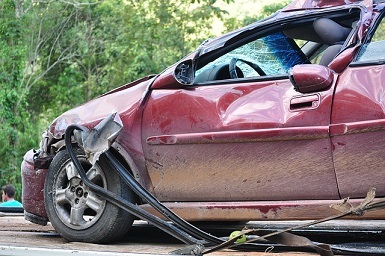 Some single car accidents are caused by a products liability defect in a motor vehicle or one of its components. Defective tires can cause blowouts, brakes may fail as well as other parts. For example, Takata, the maker of air bags that resulted in millions of motor vehicles being recalled, recently expanded its list to include 3.3 million more vehicles. In 2016, Ford Motor Company recalled over 680,000 vehicles due to defective seat belts that could fail in a crash situation. Problems such as too narrow driving lanes and potholes along with poor signage, nonfunctioning traffic lights, bad design and other problems can contribute to motor vehicle accidents. Design and maintenance of roads and signage comes under the jurisdiction of a government entity that can be local, state or even federal. Depending on the location where the accident happened, knowing what entity to place a claim against is important. Unfortunately, sometimes single vehicle accidents may be caused by a negligent driver. For example, a driver cuts too close to your vehicle, causing you to swerve to avoid a collision, but you end up crashing your car. Another example is when a driver cuts you off, and you don’t have time to react quickly enough without making a drastic maneuver. In cases of this type, proof that another negligent person caused your crash may depend on accident reconstruction, eyewitness accounts and perhaps video footage if it is available. Traumatic brain injuries: These are a major reason of disability and death in the United States. The Centers for Disease Control and Prevention estimates that 1.7 million TBIs occur annually, and many are caused by motor vehicle accidents. TBIs can range from a mild injury to a more severe one. TBIs can cause a brief change in consciousness or mental state to severe symptoms such as memory loss, lack of ability to function independently or coma and death. Spinal cord damage: This type of injury, according to WebMD, can cause nerve damage adversely affecting an individual’s ability to control their hands, arms, feet and legs or other parts of the body. Some can cause permanent paralysis. Herniated discs: Discs in the spine, which are a jelly-like substance that provides cushioning between the vertebrae, can rupture in an accident. While not all herniated discs cause symptoms, they can place pressure on nerves, resulting in significant pain. Neck injuries: Cervical strain or sprain can happen even in a motor vehicle accident at lower speeds. It can result in swelling or pain in the neck, and symptoms may not appear right away. Internal damage: A blunt force impact against the body can cause chest trauma such as a collapsed lung or broken ribs. Other internal organs may be damaged also such as the spleen or liver. Damage to the limbs: Damage of this type in a motor vehicle accident can range from abrasions and cuts to bone fractures and even amputations. Emotional distress: The emotional and psychological impact resulting from a car accident can be serious and long-lasting. These may range from nightmares and fear of going out in a motor vehicle to symptoms of post-traumatic stress disorder. I’m Ed Smith, a car accident lawyer in Stockton. If you have been injured in a single vehicle crash that wasn’t your fault, call me at (209) 227-1931 for free, friendly advice. Outside of Stockton, call (800) 404-5400, or feel free to access our online form at AutoAccident.com. It can be difficult to decide which injury lawyer to call when help is needed. Looking over reviews by previous clients can help. You can find my reviews at Yelp and Google, along with Avvo. More information on previous cases is located at Verdicts and Settlements. As a member of milliondollaradvocates.com, I belong to an group of trial attorneys with a record of settlements and/or verdicts awarded to clients of $1 million or over. For over three decades, it has been my honor to have helped Stockton residents and others in Northern California to obtain just compensation in traumatic injury cases and wrongful death claims.